France's Crushing Blow is another example of a metal band earning their metal scars over a long hard road. Missing in action from the studio since 2003's Far Away, Crushing Blow has suffered through various personnel changes since their 1997 inception. Nevertheless, with new female lead vocalist Valene at the mic, this band hopes for a better future with their latest release, Cease Fire. With strength and power of this album, I would suggest that Crushing Blow enters a new and promising era. Crushing Blow's influences are self-evident throughout this disc: invoking the best of classic melodic heavy metal, like Iron Maiden and Judas Priest, with significant doses of European power metal, Helloween for example. Melody, power and emotion are at a premium here, informing every song. For her part, Ms. Valene not only has centerfold good looks but also a sterling metal voice. Best comparison: Doro Pesch mixed with Pat Benatar Valene has strength, range, and clarity, with Rise Your Soul, Tears of Heart, and The Wizard's Tale some of her best efforts. As to the rest of Crushing Blow: expect a simmering and steady rhythm section buoyed by strong fret in the solos. In their chosen metal genre, Crushing Blow is not 'reinventing' the wheel: there's nothing overtly novel or genre-busting here. However, Cease Fire is certainly a strong and entertaining example of the best of true melodic heavy/power metal. Crushing Blow is a fine resurrection of old school heavy metal in the modern era. 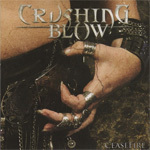 Though hardly novel, Crushing Blow's Cease Fire is certainly a strong and entertaining example of the best of true melodic heavy/power metal. Quite recommended.